Heat oven to 450°F. Make pie crust as directed on box for One-Crust Baked Shell, using 9-inch glass pie plate. Cool completely. In microwavable bowl, microwave 4 squares of the white chocolate and the milk uncovered on Medium about 2 minutes or until almost melted. Stir until melted. Cool to room temperature. In small bowl, beat cream cheese, powdered sugar and orange peel with electric mixer on low speed until smooth. Beat in white chocolate mixture. Fold whipped cream into white chocolate mixture. Spread in bottom of cooled baked shell. 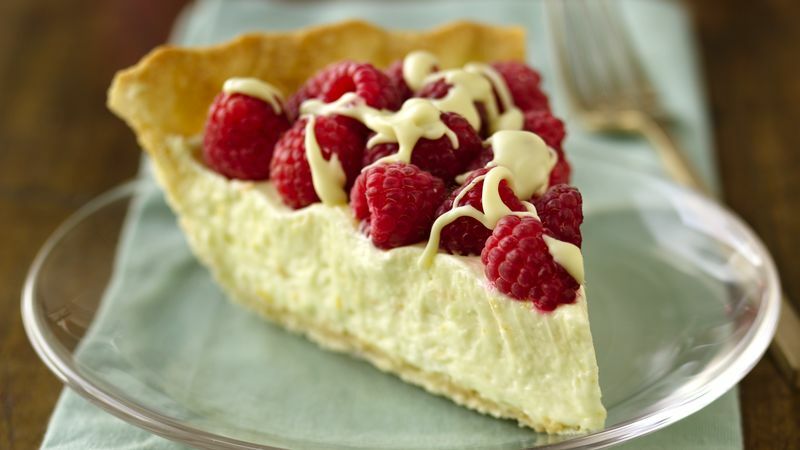 Arrange raspberries on filling. Melt remaining square of white chocolate; drizzle over pie. Refrigerate about 2 hours or until set. Cover and refrigerate any remaining pie. White chocolate is made of a mixture of sugar, cocoa butter, milk solids, lecithin and vanilla. Check to see if the label states it contains cocoa butter; if not, it's not white chocolate.